Recognize how practicing good posture, improving your work area conditions and working ergonomically will protect and strengthen your back. Identify how a healthy lifestyle, and improving your strength and flexibility, can protect you from work-related back injuries. Describe specific actions you can take to prevent work-related back injuries when moving or lifting materials. 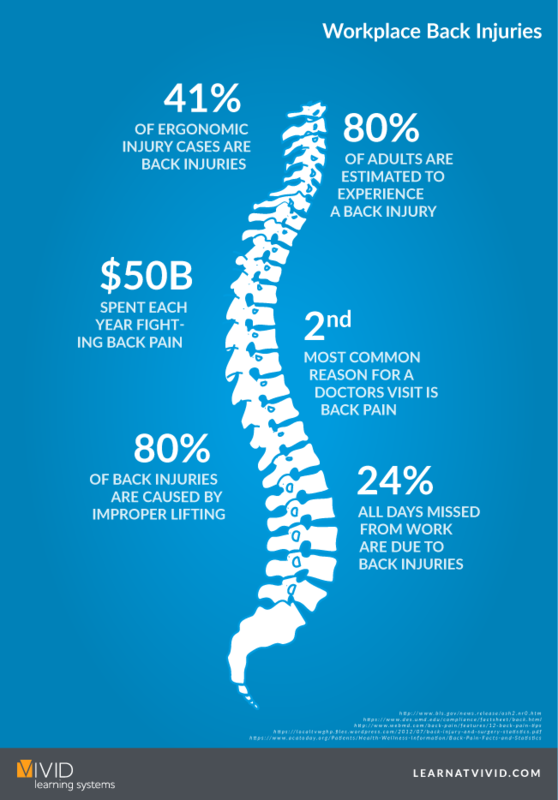 There were 177,580 injuries to the back in 2012. There’s a very good reason to have the back of your workforce by giving them the proper personal protective equipment (PPE) to avoid injuries, and training them in safe lifting techniques. Back pain is one of the most common health complaints in the United States and around the world. Back pain affects 8 out of 10 people at some point in their lives. Risks are higher for manufacturing, warehouse, hospitality and trades workers, as well as others with physically demanding jobs. As we age, the discs between the vertebrae in our backs wear away and shrink. The bones eventually start to rub against each other, which causes pain and stiffness. In addition, the space around our spinal cord narrows over time, putting pressure on the cord and spinal nerves, and causing pain. Forceful exertion involves the amount of physical effort expended to overcome the weight, resistance, or inertia of the body or a work object. Activities that require forceful exertion include carrying a heavy box from a delivery truck to a storage room or operating a handcart full of heavy materials. An awkward posture is a body position that involves bending, twisting, or reaching. Working in an awkward posture compresses tendons, nerves, and blood vessels, and increases the force a worker must apply to complete a task. Activities that involve awkward postures include reaching up to run wiring to an overhead light fixture or kneeling and bending to install carpet. Vibration is the quivering or trembling that comes from power tools and heavy equipment. Vibration restricts the blood supply to the affected body parts, which, depending on the vibration level and duration of exposure, can contribute to an ergonomic injury. Activities that expose workers to vibration include drilling a hole in a wall or sitting for a long time operating a forklift. Some tasks involve repeating the same actions with little variation. Highly repetitive tasks often involve the use of only a few muscles or body parts while the rest of the body is unaffected. When motions are repeated frequently, there may be inadequate time for muscles and tendons to recover, causing them to become strained and fatigued. Activities that require repetitive motion include moving items from a low box to a high shelf or loading cans onto a production line. People who are overweight are at greater risk for back pain, joint pain, and muscle strain than those who are not overweight. This is especially true for people with extra weight in their stomachs, because this excess weight pulls the pelvis forward and strains the lower back. A healthy, well balanced diet accompanied by a safe exercise program will help you achieve or maintain a healthy weight. Sleep is good for our bodies, so it is important to get enough sleep and to sleep in a position that maintains a natural alignment of the spine. However, it is also important to maintain an active lifestyle if you want to reduce your risk of developing back pain. The vast majority of lower back problems are muscular in origin, and if the muscles are not moved and stretched regularly, they become tight, short, and stiff, eventually resulting in back pain and injury. Correct posture and body mechanics result in less pressure on the discs and less strain to the muscles, ligaments and back joints. When your posture is good and you move your body correctly, you reduce your risk of back injury. A qualified individual may be able to help you optimize your working posture by doing an ergonomic assessment of your job and your work environment. Stress increases tension in all of your muscles, including your back muscles. Therefore, stress-reduction techniques like deep breathing and meditation may help you reduce your risk of back pain and injury. Inflexibility in the form of tight hamstrings and a limited range of motion in the trunk can increase your risk of back injury or make existing back pain worse. Some forms of exercise, such as yoga, Pilates and tai chi, may help relieve or prevent back pain by increasing flexibility.